Report prepared by Rafael Jimeno, Ph.D. The debate over comprehensive immigration reform was reignited in early 2013 by the Gang of Eight proposal and by President Obama’s own efforts to make good on campaign promises to address this issue. Recently, the Senate Judiciary Committee approved the Gang of Eight proposal for comprehensive immigration reform and it is now going to the full Senate. One of the major points of disagreement, as has been the case for the last couple of decades in American politics, is how punitive reform will be toward those individuals with undocumented status. Lawmakers are debating the merits of providing an immediate path to citizenship versus providing what has been described as a “path to the path to citizenship.” The goal is to minimize the perception in the public that legalizing the status of the estimated 11 million undocumented individuals in the country amounts to a sort of amnesty. The root of this debate is the 1986 Immigration Reform and Control Act, which was signed into law by then-President Ronald Reagan. This law was promoted as a comprehensive solution in that it combined stricter border enforcement, and workplace raids and deportations, with amnesty for contributing members of our society. Of course, complete control over the border was not forthcoming and no amount of border enforcement can contend with individuals who enter legally but overstay their visas. Nevertheless, blame for the perceived failure of this law was attributed to the provision of amnesty. Nationally, a slim majority would prefer “tougher” immigration laws. Given that immigration reform is being considered a means through which lawmakers might make inroads with the Latino community, it is important to determine where this particular subset of the American public stands. Additionally, given that no community is monolithic (and the Latino community is certainly no exception), it is also important to disaggregate Latino responses to better account for the impact of other characteristics on immigration policy positions. 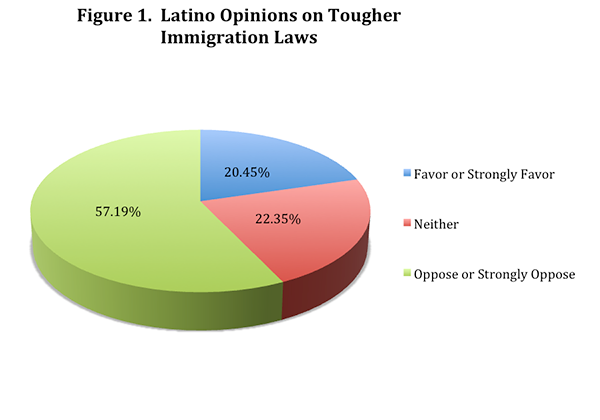 According to data from the 2012 Blair Center-Clinton School Poll overall responses by Latinos stand in contrast to national numbers, with a slim majority of this population opposing “tougher immigration laws like the one in Arizona” (See Figure 1). This item in the survey refers to Senate Bill 1070 in that state, which passed but then had some provisions blocked by a federal judge. This law had a similar scope to California’s 1994 Proposition 187, and suffered a similar fate, but Arizona’s law has the distinction of having triggered a surge in the passage of similar laws in other states. Data from the 2010 Blair-Rockefeller Poll suggested a divide between the native born and the foreign born on a host of issues, including immigration. The poll resultsshowed that while more than 40% of native born opposed or strongly opposed tougher immigration laws, more than 70% of foreign-born respondents felt the same way. This divide is still present in 2012. The 2012 poll results indicate that while the Latino community may speak with one voice in demanding reform, it is hardly clear what course of action would be most favored by the community as a whole (See Table 1). Nationally, more than 52% of Americans favor, or strongly favor, tougher immigration laws (as mentioned earlier). As evident in Table 1, support drops to 32% when only analyzing native-born Latinos, and it plunges to just below 10% among foreign-born Latinos. The level of opposition to such laws is also remarkable, and the gap between the two subgroups becomes even more pronounced. Native-born and foreign-born Latinos are approximately 30 percentage points apart, with about 42% of the native born opposing or strongly opposing tougher immigration laws, but about 72% of the foreign born stating the same. Given that the two Latino subgroups would be personally affected in different ways by any reform, it is perhaps not surprising that such a wide gulf exists between them. It is thus important to also account for issue salience, as it could be the case that naïve-born Latinos simply don’t give the issue as much importance as foreign-born Latinos. One possible explanation considered for this counterintuitive result was citizenship status. However, there were no remarkable differences between foreign-born citizens and foreign-born noncitizens and what differences did exist were not systematic. Among the foreign born, 40% of noncitizens and 47% of citizens said such laws were “important” or “very important” to them. Equally, 39% of noncitizens and 33% of citizens said such laws were either “unimportant” or “very unimportant” to them. The finer points of issue salience may remain unclear, but what is very clear from the preceding is that while native-born and foreign-born Latinos differ on how punitive they expect immigration reforms to be, the issue is no less important to either group. This likely sends a murky signal to lawmakers hoping to court the Latino vote in upcoming elections. High-profile officials, such as Senator John McCain, have made no secret of the fact that the current push for immigration reform is driven by the 2012 Presidential Election results. This election had two important developments surrounding the Latino community: 1) an increase in the proportion of the electorate that Latinos occupy, and 2) the lowest level of Latino support for a Republican Presidential candidate in recent memory. 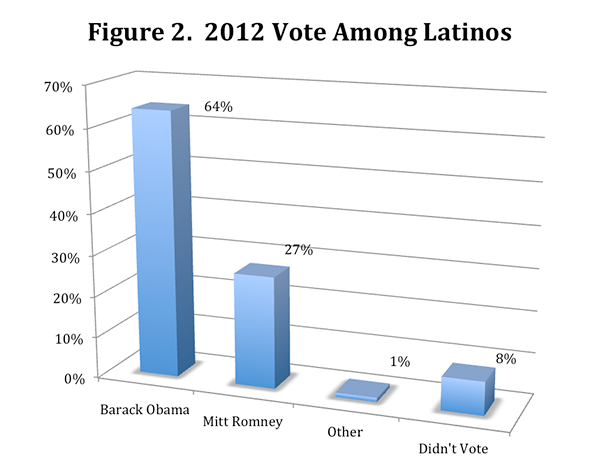 Figure 2 shows the percentage of support for each candidate among those Latinos who first answered a screening question about the 2012 election and indicated: “I am sure that I voted.” Eight percent of these individuals then reported not voting, but this should not be confused with the total percentage of nonvoters, which is obviously much higher. The 27% of Latino votes Mitt Romney received stand in stark contrast with the estimated 44% that George W. Bush received in 2004. The Romney campaign has been extensively analyzed for its failure to connect with the American public in general, and the Latino community specifically, on a host of different measures. One frequently cited example of Romney’s failure to connect with the Latino community is his support for self-deportation as an immigration policy. Thus, in a final analysis on this topic, the relationship between voting and policy preference is explored. 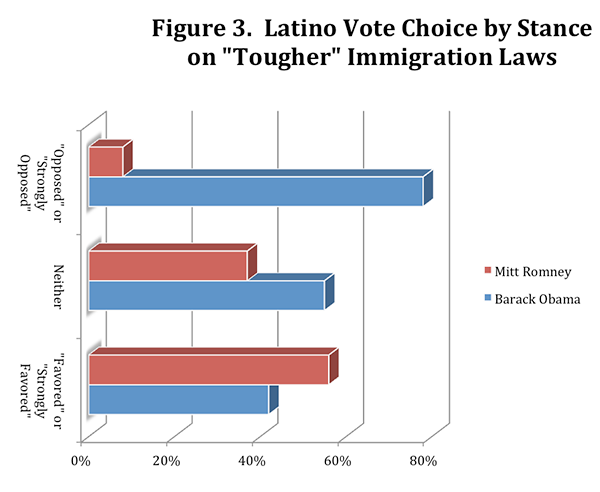 Among Latinos, support for presidential candidate was very much related to stance on the question of immigration. For analyses of the 2012 election, this finding is very interesting. It is equally interesting when evaluating the prospective chances of the Republican Party to make inroads with the Latino community. As was to be expected, 56% of those who favored or strongly favored tougher immigration laws reported voting for Mitt Romney. However, 78% of those who opposed or strongly opposed such laws reported voting for Barack Obama. This mirrors national-level results. In the Latino community, this large percentage gap is made all the more significant by the fact that the total number who voted, and opposed such laws, is about double the total number who voted and favored such laws. As noted in 2010, immigration from Latin America seems to have slowed down, for various reasons. This trend, along with increased enforcement during President Obama’s first term, has resulted in what could be described as a significant drop in the number of undocumented immigrants (from an estimated high of 12.5 million in 2007, to the 11 million that best estimates currently assert). The difference between the native born and the foreign born on an issue like immigration reform is a natural result of the disparate impact that any reform will have on these two groups. Equally evident is that individuals in the Latino community who favor tougher immigration laws have a home in the Republican Party, but the problem for the GOP is that this group is much smaller than those who oppose tougher laws and those who simply prefer Democratic candidates as a function of party identification or ideology. In upcoming years, what reform passes (if it passes), naturalization rates, and immigration trends all have the power to significantly alter what we are seeing currently. The impact of decreasing Latino immigration numbers, if they become a trend, will be multifaceted. On one hand, immigration may cease to be a hot-button issue and thus no longer hurt Republican candidates. On the other hand, given that young generations of Latinos, future voters, are being socialized in a context where the GOP is perceived to have little to offer the community, the Republican disadvantage may long outlast any demographic trends we could imagine. Knowledge Networks, (www.knowledgenetworks.com), a GfK company, administered the Blair Center-Clinton School Poll immediately following the 2012-presidential election. Its proprietary database contains a representative sample of Americans; covering traditionally hard-to-survey populations such as cell phone-only households, and households without Internet access (estimated at 23% and 30% of all households, respectively). The BCCS Poll has a total sample of 3,606 individuals aged 18 years or older including 1,110 Latinos, 843 African Americans, and 1,653 non-Hispanic white respondents. Across all racial and ethnic categories 1,792 respondents lived in the South, and 1,814 respondents lived in the non-South. The majority of respondents took approximately 20 minutes to complete the survey. Finally, respondents had the choice to complete the survey in either Spanish or English, 3,148 completed it in English, while 458 completed it in Spanish.